Ok I found Heart shaped ornaments at walmart. so I have peace and love on my tree! Oh and peace in brass for the top of the tree!! Getting lots of presents wrapped and under the tree...I have the lights on and candles burning and christmas music playing all the time, I just love christmas time! House full of men! Snowmen! Ok, Remember you can click on the photos to see them up close. shaped ornaments for the tree too! Off to shop today! 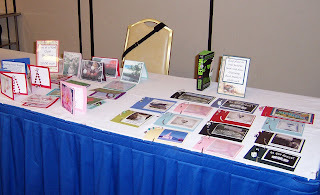 This was my table at the Newcomer luncheon, I was selling my card bracelets and my bookmarks. They are fun and fast gifts for your friends and family! The card bracelets are 20.00 and the bookmarks are 10.00. If you need a certain theme or special charm for a bookmark let me know and I will design one for you! I will try to get some up on etsy tomorrow or friday. I made 200.00 at the luncheon! The food was great, vegetable lasagne and fruit salad and bread and cheesecake. Lots of fun! Here is a picture of Ferne selling her Tastefully Simple stuff, geez, her table smelled great, she was making me hungry!! Class #3 was a resin class, I made the necklace to go with my bracelet..the resin bezels say "All you need is Love". Class #4 was a bracelet in crystals so I made the bracelets to match my snowflake necklace I made in an earlier class! I love them all, what fun! Ok No more classes till the 26th when we play with silver art clay again! Stay tuned for more fun in the sun....yes we still are in the 70's and 80's...ain't it cool!! THE DEGUEVARA RACE TEAM TAKES NINTH IN THE FALL CLASSIC!! 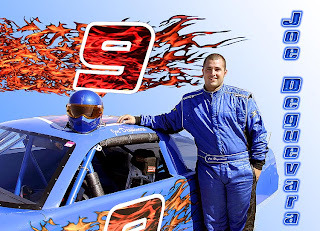 Crew Cheif Chuck and his driver son Joe grabbed the ninth position in the number nine car!! What is so amazing is the fact that the team was only 1 of 3 that even made the show from the locals in Vegas, the rest of the field were out of towners! Congratulations on your top 10 finish!! We are very proud of the both of you!! Just a little Christmas Bling for you! Loved this class, all you jewelry girls really missed out on this one, it is beautiful! It was just Betty and I in class. Ok saturday is Jiffy jewelry class...so stay tuned for more! !